Relative to seawater, groundwater typically has low salinity, is oxygen-depleted, and contains high nutrient concentrations . As a result, the groundwater-seawater interface is characterized by redox and geochemical gradients that can influence mercury bioavailability and toxicity through the microbial production of MMHg. Our work has shown that MMHg is generated in coastal aquifers and can be transported to the ocean via submarine groundwater discharge (SGD) along the coastal margin . Furthermore, this discharge may be the predominant source of mercury species in some nearshore environments, with loadings comparable to, or greater than atmospheric deposition or benthic fluxes [2-5]. Field results also suggest enhanced SGD, which includes both terrestrial groundwater and recirculated seawater, can alter mercury partitioning and/or solubility in seawater and potentially influence Hg(II) bioavailability . This phenomenon warrants further investigation, as does the observation that coastal groundwater temperature varies in concert with MMHg concentrations, possibly due to changes in bacterial activity . We will explore these hypotheses through laboratory experiments and by detailing site-specific changes in mercury speciation and partitioning in groundwater and seawater over tidal, diurnal and seasonal cycles. 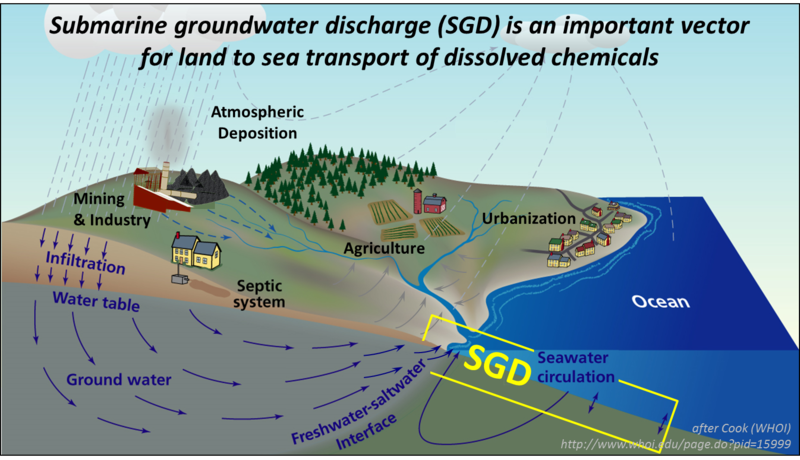 Moore, W.S., The effect of submarine groundwater discharge on the ocean. Annual Review of Marine Science, 2010. 2: p. 59-88. Black, F.J., A. Paytan, K.L. Knee, N.R. De Sieyes, P.M. Ganguli, E. Gary, and A.R. Flegal, Submarine Groundwater Discharge of Total Mercury and Monomethylmercury to Central California Coastal Waters. Environmental Science & Technology, 2009. 43(15): p. 5652-5659.monomethylmercury production and transport in nearshore surface water and groundwater: Younger Lagoon, California. in prep. Ganguli, P.M., P.W. Swarzenski, H. Dulaiova, C.R. Glenn, and A.R. Flegal, Mercury dynamics in a coastal aquifer: Maunalua Bay, O'ahu, Hawai'i. Estuarine, Coastal and Shelf Science, 2014. 140: p. 52-65.